Gastric Dilatation and Volvulus (GDV) is a life threatening disorder most commonly seen in large, deep-chested dogs. In its early stage, the stomach fills with gas, causing a simple gastric dilatation or bloat. Sometimes, the condition progresses no further than a bloat. A GDV is a progression of the bloat into a volvulus, in which the huge, gas-filled stomach twists upon itself so that both the entrance and exit of the stomach become occluded. This is a life-threatening emergency that requires surgery to correct. The exact cause is still unknown. The condition is seen most commonly in large breed dogs that eat or drink rapidly and then exercise vigorously. "Stress may be a contributing factor to GDV..."
Stress may be a contributing factor to GDV - in recent studies, dogs that were more relaxed and calm were at less risk of developing GDV than dogs described as "hyper" or "fearful". Yes. This is probably one of the most serious non-traumatic conditions seen in dogs. Immediate veterinary attention is required to save the dog's life. Are some dogs more prone than others? Yes, statistically we know that large, deep-chested breeds are more prone to GDV. These include Great Danes, Saint Bernards, Weimaraners, Irish Setters, Gordon Setters, Standard Poodles, Basset Hounds, Doberman Pinschers, and Old English Sheepdogs. It must be noted that any dog can bloat, even dachshunds and Chihuahuas. The condition usually occurs two to three hours after eating a large meal. Dogs weighing over 100 pounds have approximately a 20% risk of bloat. 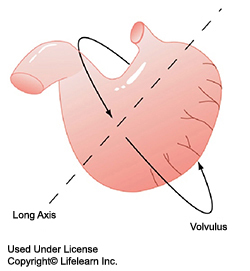 Gastric dilatation (bloat), usually without volvulus (twist), occasionally occurs in elderly small dogs. The distended stomach pushes the posterior rib cage so that the dog appears swollen or "bloated". This is most obvious on the left side and gentle tapping of the swelling just behind the last rib often produces hollow, drum-like sounds. The enlarged stomach presses on the diaphragm and breathing becomes labored. The swollen stomach presses on the larger blood vessels in the abdomen and circulation is seriously compromised, resulting in systemic shock. Ultimately, the dog collapses and the distended abdomen becomes readily apparent as the dog lies on its side. Is it possible to distinguish between gastric dilatation (GD) and gastric dilatation and volvulus (GDV)? No. These two conditions often look identical on physical examination. X-rays and other diagnostic tests are necessary to determine if the stomach has twisted. Why does the dog collapse? The gas filled stomach presses on the large veins in the abdomen that carry blood back to the heart, compromising the circulation of blood. "Vital tissues are deprived of blood and oxygen, resulting in systemic shock." Vital tissues are deprived of blood and oxygen, resulting in systemic shock. In addition, the pressure of the gas on the stomach wall results in inadequate circulation to the wall, causing tissue death. Digestion ceases and toxins accumulate in the blood, exacerbating the shock. As the distension continues to build, the stomach wall can rupture. This is an immediate and life-threatening emergency and requires immediate veterinary intervention. It is imperative that the pressure on the stomach wall and internal organs is reduced as soon as possible. The veterinarian may first attempt to pass a stomach tube. If this is not possible due to twisting of the stomach, a large bore needle may be inserted through the skin into the stomach to relieve the pressure in the stomach. Shock treatment must begin immediately, using intravenous fluids and emergency medications. Once the patient becomes stable, surgical correction of the GDV must be performed. It may be necessary to delay this major abdominal surgery until the patient is able to undergo anesthesia. The primary goals of surgery are to return the stomach to its normal position, to remove any dead or dying stomach tissues and to help prevent future GDV. 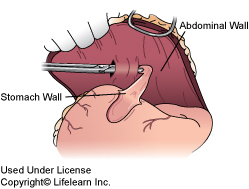 Several different techniques may be used, including gastropexy (suturing the stomach wall to the abdominal wall) andpyloroplasty (surgically opening of the pylorus to improve stomach outflow). Your veterinarian will determine the most appropriate technique or combination of techniques for your pet's condition. This depends upon how long the pet has had GDV, the degree of shock, the severity of the condition, cardiac problems, stomach wall necrosis, length of surgery, etc. Even in relatively uncomplicated cases, there is a mortality rate of 15-20% for GDV. In a recent study, if heart arrhythmias were also present at the time of diagnosis, the mortality rate increased to 38%; if tissue damage was severe enough to require removal of part of the stomach, the mortality rate jumped to 28% to 38%; if the spleen was removed, the mortality rate was 32% to 38%. Gastropexy (surgical attachment of stomach to the body wall) is the most effective means of prevention. 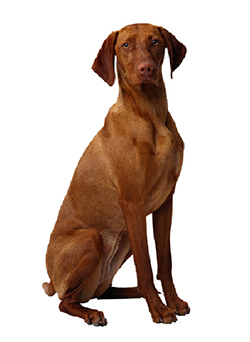 In high-risk breeds, some veterinarians recommend prophylactic (preventative) gastropexy. "This does not prevent dilatation (bloat) but does prevent twisting (volvulus) in the majority of cases." This does not prevent dilatation (bloat) but does prevent twisting (volvulus) in the majority of cases. Without gastropexy, the recurrence rate of bloat has been reported to be as high as 75%! Careful attention to diet, feeding and exercise regimens may help to prevent gastric dilatation. Please do not hesitate to discuss any concerns you have regarding this serious condition with your veterinarian.